What Kind of Food Should I Give My Blue-Nose Pit? Blue-nose pit bulls are happy, loving and athletic dogs. 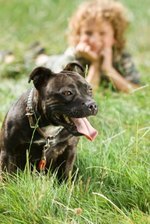 Pit bulls of all varieties have athletic builds and enjoy an active lifestyle. A healthy pit bull should look like an athlete, with a tucked-in stomach and very little fat covering the ribs or rump. With that in mind, proper nutrition is essential for keeping your blue-nose pit bull healthy and feeling good. Dogs are traditionally carnivores, but that doesn't mean that an all-meat diet is best for your pit bull. Protein, essential for a dog's health, comes in a wide range of dry and moist foods. Use a regular, nutritious dry food supplemented occasionally by a treat of moist food. Additionally, giving your dog some greens or pieces of carrot will help them get the extra vegetable nutrients that are harder to get from produced foods, according to the website Kinneman Kennels. Dry foods are often the most reasonably priced and convenient for feeding your pit bull. When selecting a dry food for your pup, ensure the food is human-grade meat, not grain-based and not filled with vegetable fillers like brewer's rice or soybean hulls, which are waste products. Don't go for dog foods that have a lot of chemical preservatives. Orijen is a recommended brand from the website Pit Bulls. In general, there are two types of canned food for dogs: standalone food that meets the full daily nutritional requirements for your dog and food meant to supplement dry food. In either case, canned food should be made primarily of high-quality meats with little or no plant products. Avoid gluten and cheap filler ingredients. Pit Bull recommends ZiwiPeak. Raw meats, raw meaty bones, pulverized vegetables are all great foods for your pit bull and, except for the veggies, require little or no preparation. With meats or bones, just plop the food into the bowl and let the dog enjoy itself. The vegetables are nutritious, but generally need to be mashed up or pulverized in a blender for dogs to benefit from them.